Born 21 Oct 1950; died 28 Jan 1986 at age 35. Ronald E(rwin) McNair was an American physicist and astronaut who was the second African American to fly in space.He had been fascinated by space since childhood, when as early as in elementary school he talked about the Sputnik satellite. McNair was nationally recognized for his work in the field of laser physics, including chemical and high-pressure lasers. In 1978, he was one of 35 applicants selected from a pool of 10,000 for NASA's space shuttle program. He was assigned as a mission specialist on the Feb 1984 flight of the shuttle Challenger, during which he orbited the earth 122 times. Sadly, on his second trip, on the morning of 28 Jan 1986, McNair with six other crew members died in an explosion shortly after launching aboard the Challenger. Born 21 Oct 1914; died 11 Feb 2005 at age 90. Undiluted Hocus-Pocus: The Autobiography of Martin Gardner, by Martin Gardner, Persi Diaconis, James Randi. - book suggestion. American food scientist who invented Pop Rocks candy, Cool Whip, the orange drink mix Tang, and quick-set Jell-O Gelatin. He developed a tapioca substitute during WW II since tapioca itself was limited in supply. For 35 years, he worked worked as a chemist for General Foods Corp, and held more than 70 patents. Pop Rocks exploding candy was patented in 1956, but not marketed until 1975. Its novelty quickly caught the public's attention. It was an accidental discovery while experimenting to produce an instant soft drink. It is a hard candy manufactured by pressurizing carbon dioxide at 600 psi in a candy syrup at 150 °C. When cooled and solidified it traps small pockets of carbon dioxide that “explode” in a person's mouth. Oswald Theodore Avery was a Canadian-American biochemist and immunologist whose research on pneumococcus bacteria made him one of the founders of immunochemistry. His research laid the groundwork for modern genetics and molecular biology. Avery spent most of his research life at Rockefeller Institute where he made important contributions to the understanding of the pneumococcus organism, a particularly virulent bacterium that caused lobar pneumonia. Prior to Avery's work, genetic material was assumed to be protein. At age 67, Avery made his most important discovery when he proved conclusively that DNA from the nucleus of the cell is the genetic material, in a seminal 1944 paper co-authored by Colin MacLeod and Maclyn McCarty. Oswald Avery and the Story of DNA, by Vesta-Nadine Severs and Jim Whiting. - book suggestion. Swedish chemist and inventor who invented dynamite and other, more powerful explosives. An explosives expert like his father, in 1866 he invented a safe and manageable form of nitroglycerin he called dynamite, and later, smokeless gunpowder and (1875) gelignite. He helped to create an industrial empire manufacturing many of his other inventions. Nobel amassed a huge fortune, much of which he left in a fund to endow the annual prizes that bear his name. First awarded in 1901, these prizes were for achievements in the areas of physics, chemistry, physiology or medicine, literature, and peace. The sixth prize, for economics, was instituted in his honour in 1969. Alfred Nobel: A Biography, by Kenne Fant. - book suggestion. Born 21 Oct 1831; died 24 Sep 1895 at age 63. The World's Greatest Fix: a History of Nitrogen and Agriculture, by G.J. Leigh. - book suggestion. Born 21 Oct 1823; died 11 Aug 1892 at age 68. Italian mathematician who is noted for his contributions to algebra and topology. His early work is in the area of equations and algebra. He wrote the first rigorous exposition of the theory of equations, previously given without proofs, developed by the noted French mathematician Évariste Galois (1811-32). Betti extended and gave proofs relating to the algebraic concepts of Galois, published in several works from 1851. Betti thus made an important contribution to the transition from classical to modern algebra. He was the first to give a proof that the Galois group is closed under multiplication. Betti also wrote a pioneering memoir on topology, the study of surfaces and space. Betti did important work in theoretical physics, in particular in potential theory and elasticity. Born 21 Oct 1788; died 14 Aug 1858 at age 69. Reminiscences of Dr. Spurzheim and George Combe and ...Phrenology..., by Nahum Capen. - book suggestion. Born 21 Oct 1785; died 6 Mar 1851 at age 65. Born 21 Oct 1736; died 11 Jul 1808 at age 71. American physician who was the first systematic teacher of anatomy, surgery, and obstetrics in the U.S. In addition to pictures and casts of the human body, he was also one of the first to use dissected human bodies in the teaching of anatomy in America. This aroused the animosity of the populace - his dissecting rooms were mobbed on several occasions, and once he narrowly escaped with his life - but his courses were very successful, and the number of students increased year by year. He lectured on both anatomy and midwifery. In 1762 he established the first American maternity hospital in Philadelphia. German physician and chemist, who developed the phlogiston theory of combustion and of such related biological processes as respiration, fermentation, and decay. Combustible objects, he said, were rich in phlogiston, and during combustion is lost. The remaining ash, now having no phlogiston, could no longer burn.The theory dominated chemical thought for almost a century. He extended the idea to the rusting of metals: metal had phlogiston, rust did not. Air was only indirectly involved in his idea of combustion. It was a carrier of phlogiston, as when charcoal burns phlogiston could be transferred to a metal ore which then converts to metal. At times, Stahl believed in alchemy and animism, though he had rational views on mental disease. Danish astronomer who classified types of stars by relating their surface temperature (or colour) to their absolute brightness. A few years later Henry Russell illustrated this relationship graphically in what is now known as the Hertzsprung-Russell diagram, which has become fundamental to the study of stellar evolution. In 1913 he established the luminosity scale of Cepheid variable stars. Died 21 Oct 1896 at age 52 (born 6 Aug 1844). Died 21 Oct 1872 at age 78 (born 5 Mar 1794). 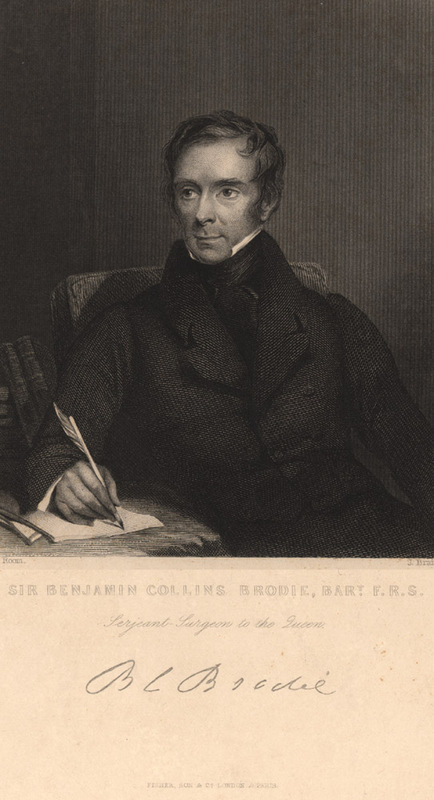 (1st Baronet) British physiologist and surgeon whose name is applied to certain diseases of the bones and joints. As one of the outstanding surgeons of 19th-century London, he opposed the prevailing practice of indiscriminate amputation, always trying to save the limb instead. He pioneered the surgery of varicose veins. In 1814, he described synovitis in the knee joint. In his book Pathological and Surgical Observations on the Diseases of the Joints (1818), he traced the beginnings of disease in the different tissues that form a joint and to give an exact value to the symptom of pain as evidence of organic disease. This work led to conservative measures in the treatment of diseases of the joints, with a consequent reduction in the number of amputations and the saving of many limbs and lives. In 1843 a tuberculous abscess in the head of the tibia, Brodie's abscess. He lectured on hysterical pain. Brodie's knee came to refer to a condition of stiff knees frequently observed in hysterical patients. From research with animals, he disproved the chemical theory of animal heat, which held that respiration was the immediate source of heat production. The American Experience: The Boy in the Bubble (DVD), by PBS. - book suggestion. In 1915, the first experimental transatlantic radiotelephone speech communication was made. Taking advantage of the recently developed vacuum-tube transmitters and receivers, AT&T conducted radiotelephony tests from NAA, the U.S. Navy station in Arlington. B. Webb of AT&T in Arlington, VA.Virginia talks to Lt. Col. Ferries of the French Government using relay points in Canada and at the Eiffel Tower in Paris.His voice was heard as far away as Honolulu, HI., which clearly showed how advanced the vacuum-tube equipment was, since the "somewhat over 10 miles" (16-km) range of Fessenden's groundbreaking alternator-transmitter tests (1906). President Vail announced that AT&T was planning to add radiotelephone links to the Bell system. In 1895, liquid air for refrigeration and other purposes largely produced by machinery, invented by Carl Linde, was reported. Linde: History of a Technology Corporation, 1879-2004, by Hans-Liudger Dienel. - book suggestion. Booklist for Carl von Linde. In 1879, Thomas A. Edison successfully demonstrated the first durable and commercially practical electric light bulb at his laboratory in Menlo Park, New Jersey. This model lasted 40 hours before burning out. The idea of electric lighting was not new; several people, including Joseph Swan, had worked on and even developed forms of electric lighting. However, nothing durable had been developed that was practical for home use. The difficulty was finding a suitable material for the filament. Edison tested over 6,000 vegetable growths (baywood, boxwood, hickory, cedar, flax, bamboo) as filament material. After one and a half years of work, after spending $40,000, and performing 1,200 experiments, success was achieved when an incandescent lamp with a filament of carbonized sewing thread.